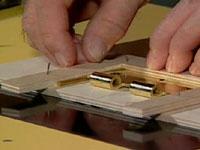 Router Workshop: A Simple Hinge Pattern! Using the correct direction of feed. 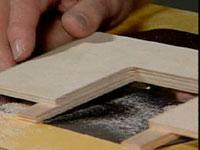 Today�s router tip will demonstrate the steps needed to make a simple hinge pattern. 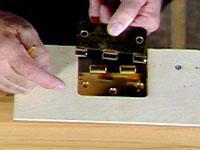 In today�s example we are going to make the pattern to position the hinges for a door. 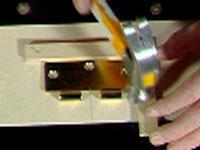 The tools needed to make the pattern are: the hinge (as the pattern), small sticks (as pattern locators), the flush trim bit and brass spacer bars (to compensate the space between the outside diameter of the guide and the outside diameter of the cutter). 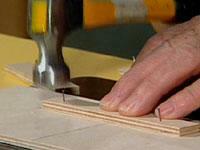 To locate the back position of the pattern, use the hinge as a guide and nail the pattern stick tight to the hinge. 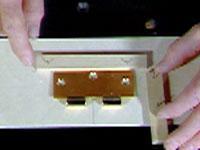 See the photo showing the hinge and back stick location of the pattern. 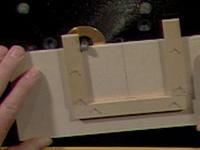 Step 2:Find the center of the hinge and be sure to find the correct position with guidance of the pencil line marked on the pattern material. 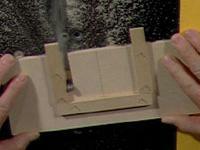 Next locate the stick for the left side of the pattern and fasten into position. Be sure it is square to the back piece. 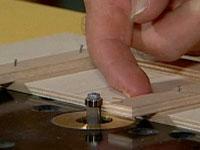 Use the flush trim router bit to cut the pattern. Notice that the sticks are positioned beyond the pattern for both the in-feed and out-feed side of the pattern. 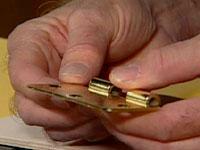 The reason for this is to allow the bearing to contact the sticks for support prior to cutting the pattern. 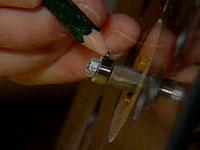 It is very important to give the moving router bit a place to start and finish. The correct direction of feed is very important, always move into the cutting rotation of the bit. Follow the sequence of the photos below.